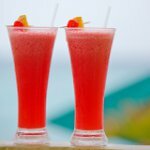 The National Punch Day (also referred to as the National Rum Punch Day) is celebrated on September 20. The term “punch” referrers to a wide assortment of drinks, which are typically served at the parties. Punch originates in India. The word “punch” is derived from the Sanskrit word which means “five”. The drink was so named because it was originally made with five ingredients: alcohol (typically wine or brandy), water, lemon, sugar, and tea or spices. British sailors brought punch to England from India in the 1630s. Around 1650s, wine and brandy were replaced by Jamaican rum, and today's punch emerged. Punch can be made with other alcoholic drinks, but rum-based punches are the most popular. Non-alcoholic punch variations also exist. Punch is typically made with fruit juices and other drink mixers, alcohol (for alcoholic punches), fruit, and sugar or other sweeteners. It is served in large, wide bowls, known as punch bowls. Punches are often served at college parties. Such punches are usually made with cheap ingredients and contain much alcohol. To celebrate the National Punch Day, throw a party and serve several punch bowls with different punches for your guest to enjoy. Don't forget to drink responsibly!